PORTLAND, Ore. (April 16, 2013) – Women in the Pet Industry Network (WIPIN), the pet industry’s leading organization focused on women who want to grow their businesses, is calling on business experts to share their knowledge and tips as speakers at “The Start of Something Big!” Conference & Awards Show in Portland, Aug. 23-25, 2013. Confirmed speakers include Yvonne DiVita of BlogPaws, Kristen Levine of Fetching Communications and Dave Blanchard of Cognesis Marketing Concepts. As the pet industry’s first-ever women-focused conference and awards show, The Start of Something Big! offers members, speakers and pet industry sponsors unique networking opportunities, educational sessions and roundtable discussions, along with the first WIPIN Pet Industry Women of the Year Awards, which will recognize outstanding women in the pet industry in four categories (Solopreneur, Entrepreneur, Corporation, and Advocate). Experts interested in speaking at the conference can view the speaker application and submit their proposals here. For more information about The Start of Something Big! 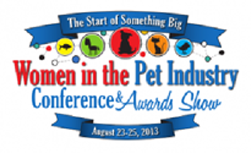 Conference & Awards Show, please visit www.womeninthepetindustry.com/conference/. Established in 2010, and then acquired in 2012 by Shawna Schuh, the current president and Chief Pet Wrangler, WIPIN is headquartered near Portland, Ore., and serves a worldwide membership base of women in the pet industry. WIPIN helps entrepreneurial women grow their pet-focused businesses through unique networking opportunities, valuable business growth meetings and online resources. The Start of Something Big! Conference & Awards Show in August 2013 will bring women together to connect, network, and learn how to grow their pet-focused businesses. WIPIN is affiliated with Black Dog Education, Animal Wellness Magazine and PetIndustryTV.com. With nearly 200 members, WIPIN is the premier networking organization for women in the pet industry, offering its members the opportunity to connect, share and learn from other likeminded professionals. Learn more about the benefits of becoming a member at www.womeninthepetindustry.com/join/. For more information, please visit www.womeninthepetindustry.com, or contact Schuh at 503-970-5774, 877-474-2962 or shawna@womeninthepetindustry.com.